Gaddafi Stadium normally refers to a cricket ground in Lahore, Pakistan. It was designed by Pakistani architect Murat Khan and completed in 1959. Some additions were added many years later by Nayyar Ali Dada. Following the ground's renovation for the 1996 Cricket World Cup, it has a capacity of over 60,000 spectators . 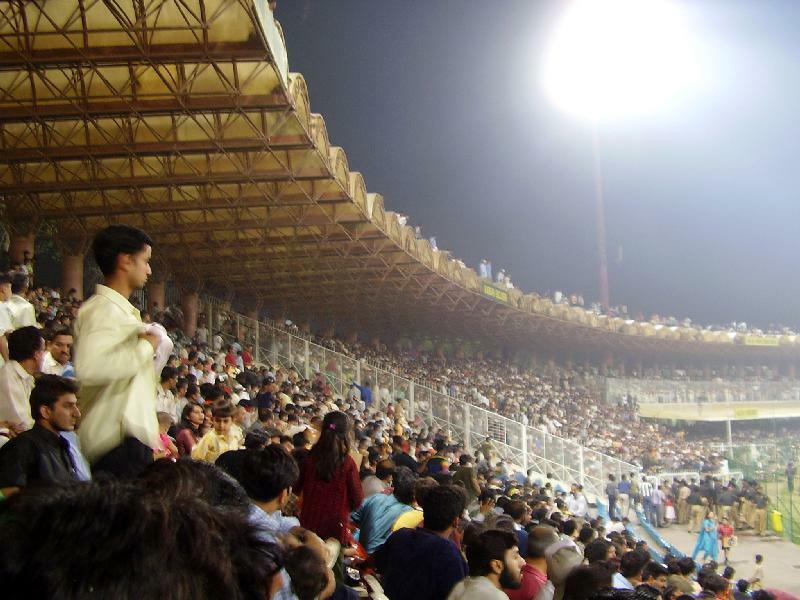 The stadium was originally named the "Lahore Stadium", but was renamed in 1974, in honour of Colonel Gaddafi. The ground was originally named "Lahore Stadium", but was renamed in 1974 in honour of Colonel Gaddafi of Libya after a rousing speech he gave at an Organisation of the Islamic Conference meeting in favour of Pakistan's right to pursue nuclear weapons. Gaddafi Stadium also houses the headquarters of the Pakistan Cricket Board. In 1995-96, the stadium was completely renovated by original architect Nayyar Ali Dada for the 1996 Cricket World Cup. The stadium held the final, with over 60,000 spectators. Designed by the famous architect Nayyar Ali Dada who modelled it on the Mughal School of red hand-laid brickwork and arches, the new stadium is completely covered with plastic seating rather than concrete benches. The lower portion under the stands has been enclosed and converted to shops for boutiques and offices. This was the first stadium in Pakistan to be equipped with modern floodlights which have their own standby power generators. Modern facilities for the media are also provided. On 3 March 2009, the scheduled third day of second Test of 2008–09 Sri Lanka tour of Pakistan, the Sri Lankan team's convoy was attacked by armed militants at Liberty round about near Gaddafi stadium. Eight Sri Lankan players were injured, including Sri Lankan captain, Mahela Jayawardene. The Sri Lankan team was air-lifted from Gaddafi Stadium to a nearby airbase, from where they were evacuated back to Sri Lanka.